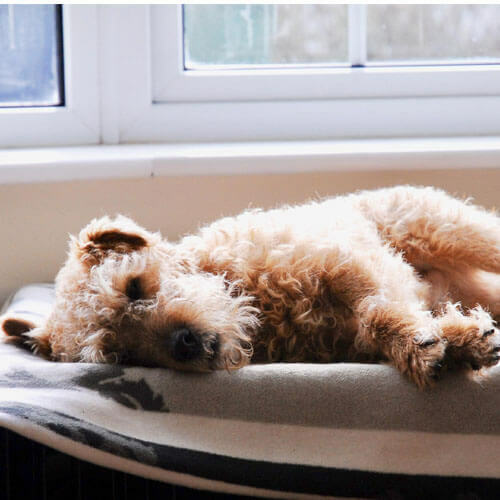 We all love our furry friends but they can sometimes cause a little bit of a mess - whether that be leaving a trail of fluff behind or a doggy scent wherever they’ve wandered. Today, Joanne from Expert Home Tips shows us that you don’t have to live in the dog house! Read on and discover some simple cleaning tricks for your dog and home. Think about it – you shower regularly, so your dog should too. 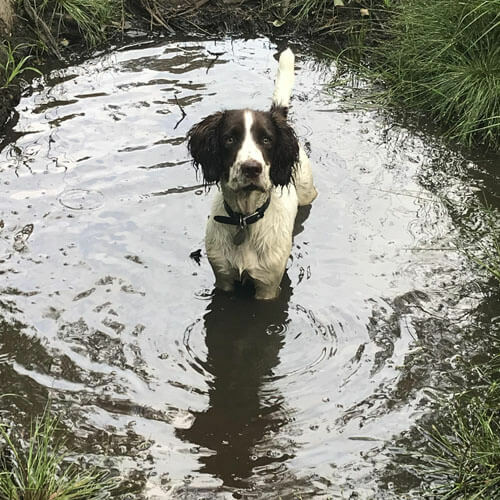 Don’t wait for them to have a particularly muddy walk - keep bad smells at bay by giving them a wash every month with a dog friendly shampoo. Try to give your dog a regular brush to remove loose hairs. A de-shedding tool will be your new best friend. If you’re not up for the challenge, you don’t have time, or your dog requires a bit more grooming, you can always pay for a professional pamper. Not only are they great at removing hair from clothing, but virtually everywhere else in your home too. They’re really affordable, so it’s always great to keep one handy for quick cleaning. Give your sofas, cushions and beds a swipe with one. They’ll be good as new! A standard vacuum may not be effective enough to hoover up all that stubborn dog fur. Why not upgrade to a special pet hoover that’s designed to tackle pet fur and dirt. TOP TIP: Dyson sell a special attachment for their vacuums that can be used to brush your pet. Your dog’s collar goes through a lot, so don’t forget to give it a good scrub occasionally - it’s highly likely that most of your doggy odours are lurking there! Place it in a washing up bowl of hot water with a generous amount of dog shampoo. Leave to soak for 30 minutes and then scrub any surface stains and debris. Rinse with clean water and leave to dry. Dinner time can get messy if you’re not careful. Place bowls on a tray or a rubber mat to contain spills and make cleaning up a breeze. Pour pet food from the big, bulky bag into a cereal container to make meal times less of a work out. TOP TIP: Has your dog got stinky breath? Add a small amount of parsley to their dinner. It’s really good for them and neutralizes the bad smell. If you have a heavy shedding dog why not invest in some blankets for your furnishings. Sofas, beds and chairs – get a blanket and spread over any spots that they like to snuggle on to make cleaning easy. The blankets will catch all the hair, dirt and odour. When you have guests over, remove the blankets and spritz the furnishings with a fabric freshener. When the blankets are getting a bit smelly, refresh them in the wash.
Are your pups toys looking a bit mucky? There’s no need to throw them away! Pop hard toys in the dishwasher on a regular cycle. Soft toys can be cleaned too. Just throw them inside a pillowcase or delicates bag and pop them in the washing machine on a hand wash or delicate cycle. When all the toys are clean and dry, store them in a basket to keep your house looking tidy. Keep it somewhere they can easily find their favourite toys. 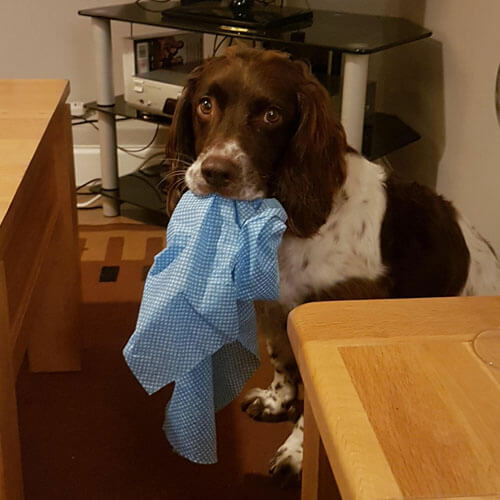 There’s nothing worse than getting back from an unexpectedly muddy or wet walk and having your dog run loose in the house whilst you try to find a towel. If possible, make sure that you can bring your dog round the back of your house and into a secure garden. Alternatively leave a few old towels by the back or front door ready for use along with anything else you think you might need. You might want to give your dog a proper wash in the bathroom, but at least now they’ll be clean enough to get there without destroying carpets and splashing walls! Carpets can soon get bogged down in layers of fur. If your vacuum isn’t cutting it, don’t fret, because there are dirt cheap tools you can use, and we bet you already have them in your house! A rubber glove works wonders. Place on your hand and drag along sections of the carpet. Alternatively, put a shower squeegee to use - again, just drag along the carpet and you’ll be pulling up loads of hair in no time. We hope these top tips help for those messy moments, and don’t worry, they happen to the best of us!